NAIROBI, Kenya -- Police on the island nation of Seychelles say that two former U.S. Navy SEALs found dead aboard the ship Maersk Alabama died of respiratory failure and were suspected to have had heart attacks, possibly from drug use.
} 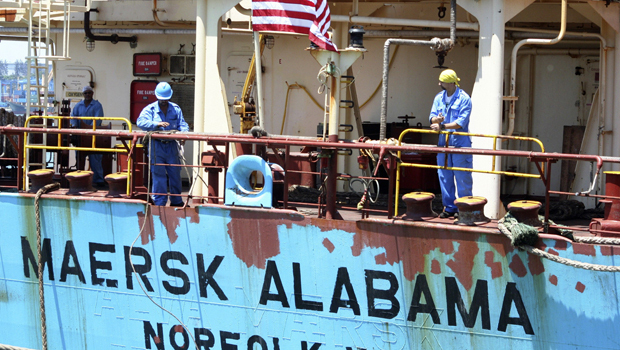 The ship the men worked on, the Maersk Alabama, was the focus of a 2009 hijacking dramatized in the movie "Captain Phillips." The U.S. Coast Guard is also investigating the deaths. The two men worked for U.S.-based Trident Security, according to police. Former military personnel frequently provide security on board ships sailing through the waters off Somalia to provide security against pirate attacks. The Maersk Line said the cause of death is under investigation but is "not related to vessel operations or their duties as security personnel." The Maersk Alabama's home port is in Norfolk, Va., where its parent company Maersk Line, Ltd. is also headquartered. The Maersk Alabama transports food aid to East Africa in support of the U.S. government's "Food for Peace" program, according to the company. Crew members also help support the Bee Hive Children's Home in Mombasa, Kenya.
} Several crew members who were aboard the ship when it was hijacked in 2009 are currently suing Maersk Line Ltd. and Mobile, Ala.-based Waterman Steamship Corp. over the attack. The hijacking captured world headlines in 2009 and again when the movie, "Captain Phillips" was released recently. The five-day hijacking standoff ended when Navy SEALs aboard the USS Bainbridge shot and killed three of the pirates who were holding Capt. Richard Phillips in a lifeboat. Nine crew members in the lawsuit filed in Alabama in 2012 say they suffered physical and emotional injuries after Somali pirates boarded. Some crew members were held at gunpoint with Phillips, and others hid in an engine room.